Wholesaling is a means that many investors, myself included, have used to jump into the world of real estate investing. As a wholesale investor, you don’t actually own properties. Rather, you find contracts and sell them, and then collect a finder’s fee. Wholesaling is a great way for someone with limited capital to kickstart their investing journey and get funds in the bank quickly. On this episode of Investing in Real Estate, I’m interviewing Brent Daniels of Wholesaling Inc. Brent is a master wholesaler and expert cold caller who works with my mentor in wholesaling, Tom Krol. On today’s show, Brent is walking us through how to find discounted properties through wholesaling, and what it takes to successfully cold call. 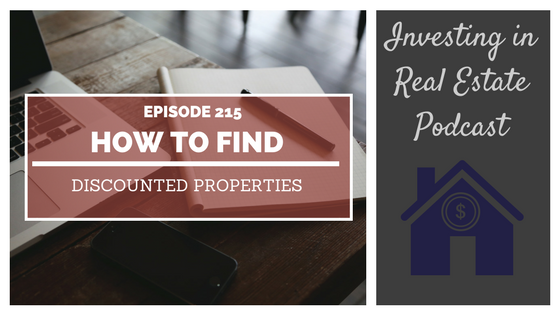 We’re also sharing a special offer; don’t miss episode 215 of Investing in Real Estate! Brent explains that he fell into wholesaling. He’s been a licensed real estate agent since 2004, but after the crash he had no budget for real estate. He began door knocking in neighborhoods that he knew were popular among investors. His intention was to find off-market properties for his investor clients, get the properties under contracts, and they would assign the contracts to a different investor. The closing statement on his first deal had a $30,000 assignment fee. As a realtor, he didn’t understand what an assignment fee was. He quickly learned that an assignment fee is a finder’s fee that a wholesaler takes for finding the deal. Next, Brent took Tom Krol’s course, and his wholesaling career exploded. He and his team were able to earn over $730,000 in assignment fees in their first deal. Wholesaling is an incredible way to create capital in real estate. If you’re interested in pursing this strategy, we have partnered with Wholesaling Inc. to help you get off on the right foot. Click here to get your start in wholesaling. What are the two main courses that Wholesaling Inc. provides? How much can you make in a wholesaling deal? Why is wholesaling such an effective strategy? What are the four cornerstones of cold calling? Special Offer: Work with Wholesaling Inc.